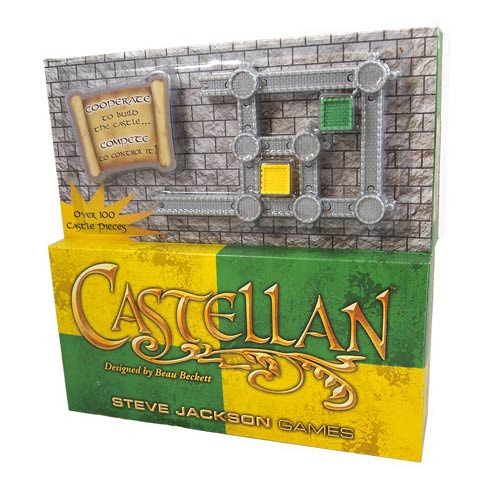 In this Castellan Yellow and Green Multilingual Game two players work together to build a castle. Finely detailed wall and tower pieces link together to form courtyards, and the player who finishes a courtyard claims it with a Keep, scoring points for that courtyard equal to the number of tower pieces surrounding it. Each player starts the game with two decks of cards: a Wall Deck and a Tower Deck. Each card allows a player to play the components shown on it, with the Wall Deck cards always depicting at least one wall (and some combinations of walls/towers) and the Tower Deck cards always depicting at least one tower (and again, some combinations of walls/towers). Combine with the Red and Blue set to play with four players. Ages 10 and up.